Gainsborough is about 18 miles north-west of Lincoln, and may be accessed either from the A1 or the A15.From the north-west, travel down the A1(M), Doncaster By-pass, then take junction 34, the A614 towards Bawtry. Turn right onto the A631 which will take you straight into Gainsborough.From the South, take the A1 as far as north as the A57 Newark-on-Trent turnoff.On the edge of Newark, turn left onto the A1133 and follow the signs to Gainsborough. If you are on the A15, Lincoln, then turn left onto the A631 at Caenby Corner, some eight miles north of Lincoln or an equal distance south of the M180. There is station at Lea Road, Gainsborough, reached by taking a train to Retford in Nottinghamshire, and changing there if you are coming from the south, or from Doncaster if you are travelling from the north.The Gainsborough Central station is closer, but it is a branch line from Lea Road. You can travel by bus on the Lincoln to Scunthorpe route, no. 100 which stops in Gainsborough. Once you are in the centre of Gainsborough, follow the brown tourist signs to the Old Hall. 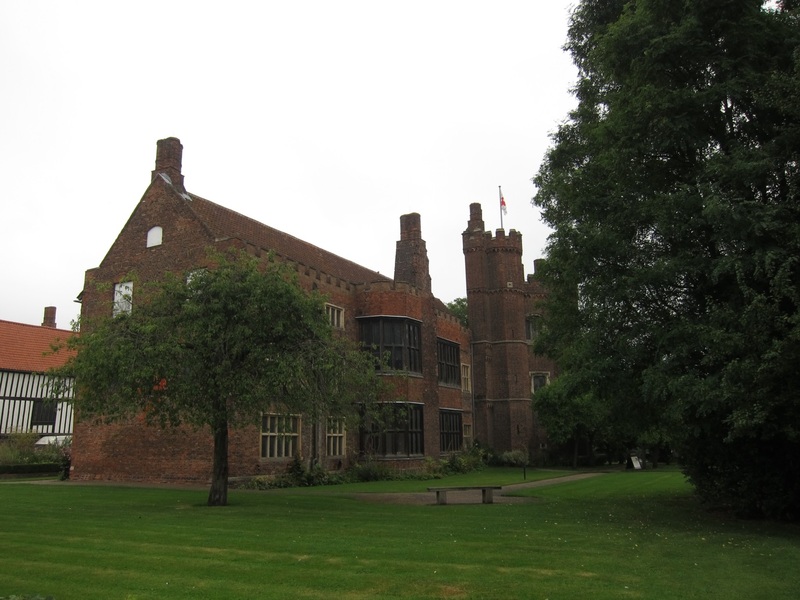 Gainsborough Old Hall is a remarkable example of a house built in the 15 th century as a comfortable home which, unlike the majority of houses of the period, has hardly been altered since its construction. finally, as the location where the Puritan congregation that would form the core of the Mayflower Pilgrims was sheltered. The town shows traces of early industry, with redbrick mills amongst the low level modern industrial estates. The Hall and Church are signposted with brown tourist signs and the injunction to park in any of the town car parks. There is an old high street, with the typical eighteenth century facades over later shop fronts. It is not especially attractive. Around 500 yards from the high street, amongst the rows of Victorian houses, on the site of about two typical blocks is the Hall. It is quite disconcerting to see it surrounded with houses, charitable institutions and some abandoned buildings. The Hall is owned by English Heritage and it is still part of the life of the town with regular civic events held in it, and frequent weddings.